International Journal of Research in Health Sciences,2015,3,4,429-434. 1,6–Professor, 2–Associate Professor, 3,4,5–Assistant Professors, Department of Anesthesiology and Critical Care MOSC Medical College Hospital Kolenchery, Kerala, INDIA. 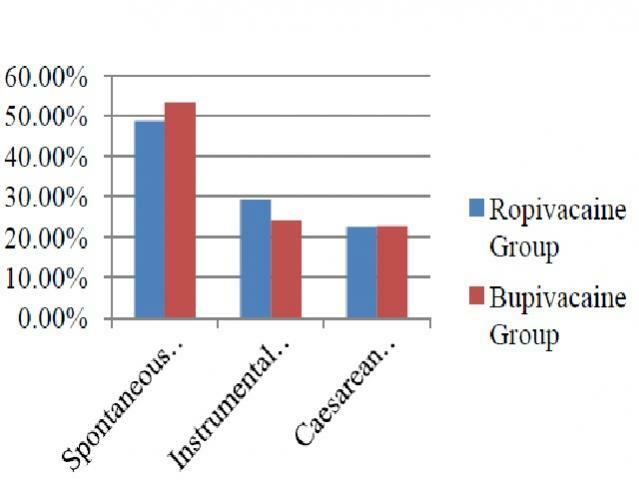 Background: Conventional high doses of bupivacaine (0.25%), used for epidural labor analgesia result in increased operative delivery which is undesirable. Lower concentrations of local anesthetics and drugs like ropivacaine with high sensory motor block ratio may cause lesser motor blockade and result in lesser operative delivery. Opioids are added for its synergetic analgesic effect. This is a prospective, randomized, double blind study to assess the obstetric outcome following epidural infusion of ropivacaine (0.1%) and bupivacaine (0.0625%) both with fentanyl (0.001%) and to substantiate if there is any outcome advantage with ropivacaine over bupivacaine. Method: 350 ASA I primigravidae with singleton cephalic presentation were randomized to two groups to receive either of the study drugs. Initial bolus of 10ml drug was followed by infusion at 5ml/hour. Five ml top ups were given for break through pain and for perineal analgesia in the second stage of labor. Besides obstetric outcome, (the primary end point of the study) motor block, quality of analgesia, maternal and neonatal safety were considered. Analysis of variables of interest is compared using independent sample t-test (SPSS 22 version). A p-value of <0.05 was considered significant. Results: Total of 340 patients (ropivacaine-169 and bupivacaine-171) completed the study. Operative delivery was similar in both the groups [51.48% (ropivacaine) and 46.78% (bupivacaine)]. There was no motor block (as per modified Bromage scale) in any of the parturients. The safety of the mother and neonate was ensured. Subjective score of quality of analgesia was ‘excellent to good’ in 80% of the parturients. Conclusion: We concluded that both ropivacaine and bupivacaine in weak concentration with fentanyl confer adequate analgesia, maternal and fetal safety and that the choice of drug does not influence the mode of delivery.